A cool, contemporary setting and impressive, interesting northern Vietnamese dishes makes this Rainier Valley spot stand out. With gleaming white tile in the open kitchen, gunmetal gray chairs that are more about style than comfort, lots of windows for an airy feeling, and an on-site garden for the freshest possible culinary herbs, Wicked Chopstix is cool and contemporary. The two nods to days gone by are the abundant free parking (with spaces on either side of the building) and the surprise of the ’00s Irish boy band Westlife on the sound system. Owner Michael Nguyen was raised in Seattle, with family roots in the coastal North Vietnamese city of Hai Phong. His sister, Ida, is the manager. Chi Yen, the chef they hired, is from the same city, and this region is celebrated in many of the dishes. As we deliberated over the menu, Ida wafted plates for other tables slowly past us, name-checking cha cã la vong (grilled fish with dill noodles), bún cha (grilled pork patties with noodles), and mì Quang, a colorful noodle dish from the Da Nang area. All looked so compelling that seeing them was no real help in final decisions. The menu: It’s compact — about 15 items, plus a list of flavors for the milk tea and fruit shakes. About half of the dishes are some form of pho, including the less-common-in-Seattle oxtail and veal; all are available in three sizes, a nice touch. Every month brings new specials, which can be found on the restaurant’s Facebook page, and some of those specials, like bò né (tender, buttery chunks of beef served with fried eggs on a sizzling platter, with rice or baguette on the side), end up on the regular menu. 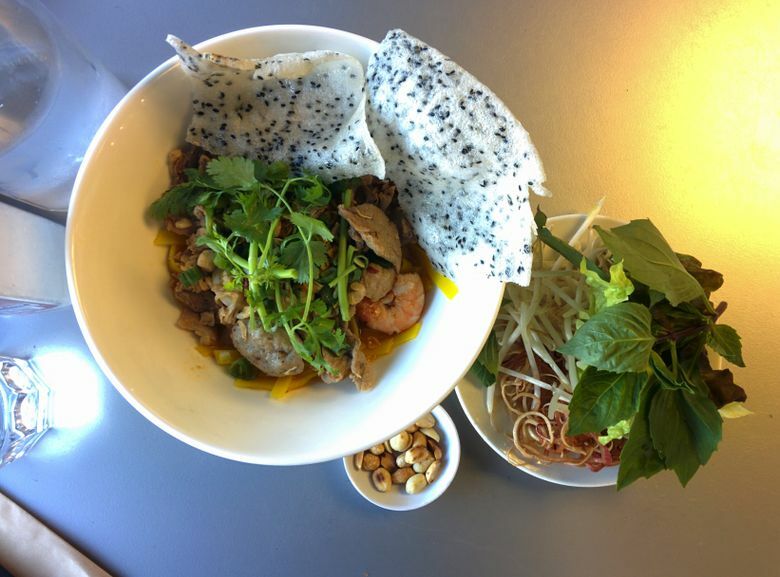 Don’t miss: Mì Quang shows off an impressive range of textures, flavors and garnishes. The bottom of the bowl has a small amount of turmeric-enriched broth, with a layer of medium-wide rice noodles. Slightly fatty sliced pork, one pork meatball, half a hard-boiled egg and two good-sized shrimp sit between the noodles and a heap of cilantro and green onion, while two airy, black sesame rice crackers fan out at the side of the bowl. Peanuts, leaf lettuce, basil and bean sprouts are served on the side. The noodles take on rich flavor from the broth, and every bite is compellingly different. If it’s a hot day, pick up a cup of yogurt sticky rice for dessert — the layers of chewy black rice, tart yogurt and crushed ice make an irresistible and refreshing combination. What to skip: The pineapple shake didn’t live up to the image a fresh fruit shake inspires — flat rather than fresh, it was too sweet even for the die-hard bubble-tea fans. Prices: Pork belly bun ($4 each), mì Quang ($12), bò né ($15), pineapple milkshake ($5) and yogurt sticky rice ($5) added up to $41 for dinner for two, plus tax (the restaurant has a no-tipping policy).